I don't know about you, but when I'm flying twelve feet across a room to kick some guy up in the head, I tend not to notice interactive paper debris. Still, before Arkham Knight is released—in this moment of calm before the punching—we can passively appreciate the PC-specific splendour of Rocksteady's latest via this, a new Nvidia video. 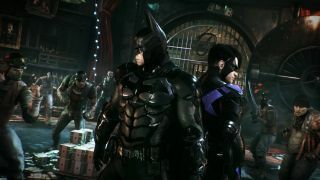 The trailer demonstrates the Gameworks effects that are being implemented for Arkham Knight. Most of them fit into the 'impressive but kinda pointless, ultimately' category. Hopefully their inclusion in this game won't result in any performance issues for non-Nvidia users. Batman: Arkham Knight is out in two weeks, on June 23.